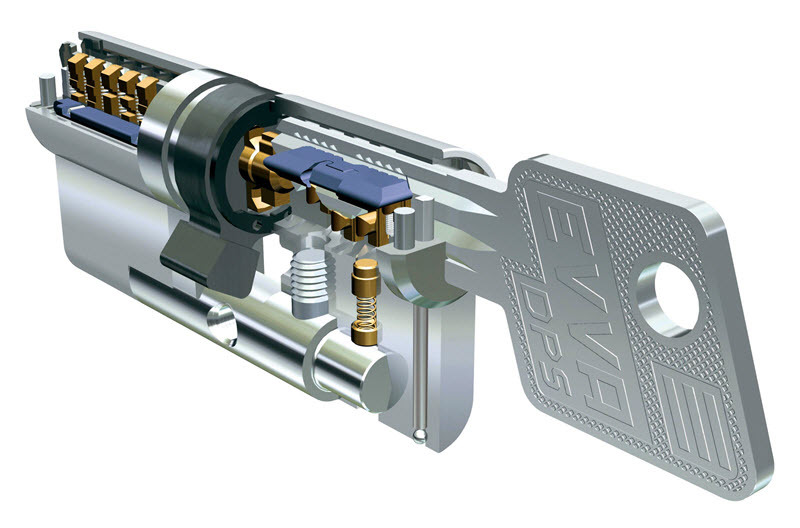 The EVVA Double Profile Integrated (DPS) system is a scalable, high-quality, patented, mechanical Master Key system which is particularly suited to commercial & industrial applications requiring the highest of security locking systems such as airports, universities, councils, hospitals, and schools. The EVVA DPS system is like no other master key system. It’s design and features redefine the standard of lock and key security and the unique pinning system, which uses sliders to activate a control bar with no traditional top pins, means the system can be scalable as required without compromising security and quality. EVVA has high-security, anti-pick, anti-bump sliders made from Teflon impregnated nickel silver. They are protected by hardened sidebar blocking pins and a key control hook pin. In the front of the cylinder the hardened steel pins protect the cylinder against physical attacks and entry methods such as drilling, lock manipulation or lock bumping. The double profile cylinder has a locking cylinder on each side that is key operated, with an optional external override mode that allows the external keys to always open the lock even if the key is left in the inside. This provides additional security measures and allows for emergency access as needed. EVVA is compatible with all current key control management software. The EVVA is a complete system and includes cylinders to suit all types and brands of locks, which means it is easy to incorporate the EVVA Master Key system into whatever current locks you have in place. Phone us on 0404 804 444 for more information and a quote.